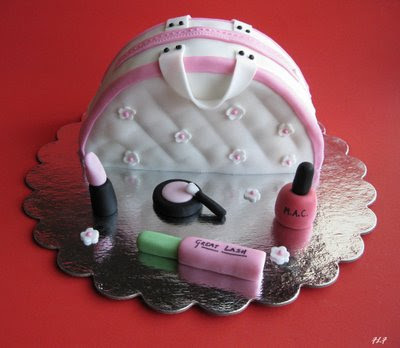 A friend had her birthday recently and I felt this cake was very apt for her because she is a beautician. 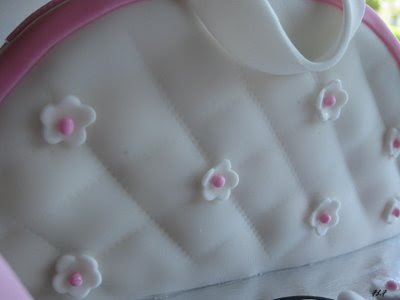 As with each and every cake, I enjoyed doing the detail work. 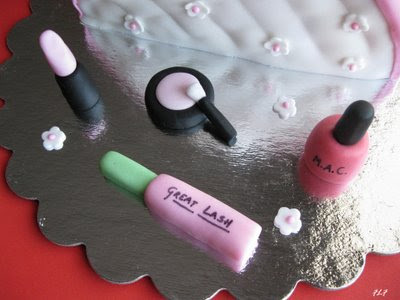 Its a Vanilla cake covered in Fondant and the 'cosmetics' are made out of Fondant. Hmm the mascara and nail polish bottle are very realistic! oh my god!! the details on the bag are so good!! this is pure talent, i must say! Loved the cosmetics and the details on the bag..ur fren is really really lucky..
Aaaah...! Here ur pics of cake are die for! What a talent u got. Great work indeed. Hey Namratha, the details on this cake is so amazing and cosmetics are so cute by the way how did she manage to cut the cake?? I mean I wouldnt have had the heart to cut this cute cake!!! Namratha..Bag look's real! The stitch like detail's on bag is greatly imitated. Love the color combi too! Great Work! You are exceptionally talented and creative Namratha.Very beautiful cake.Wish I could be lucky enough to see these beautiful cakes real. It is so neat!! love it! this not a cake but a piece of art. you are an Artist Namrata! wow what a talent, great work, awesome cake, Couldnt have enough heart to cut it. Too pretty to be eaten! Nams, u outbeat urself everytime. This is simply superb!! hats off girl!! !